Unless you have more evidence the firing squad seems premature. The two paragraphs as they stand do not amount to plagiarism. Using plain facts reported by another journalist in a respectable magazine is not by any stretch of PC madness plagiarism. 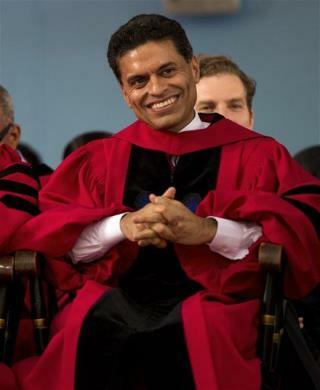 The luckless Fareed did not lift the opinion of the New Yorker writer (about the "nuance" of the book) , just the facts. He named the source, a book. He just replayed the facts in the book, according to the New Yorker report. Plagiarism is adopting someone else's art without attribution. There is no art in the NTorker quote except for the "nuanced" compliment. You need a different example before you can charge plagiarism. Is there one? Presumably there is or Fareed has panicked and been derailed without justification. Meanwhile everyone piles on the luckless fellow like dogs on a hare. The lynch mob mentality is a danger to the community. Maybe Fareed was right to fear it and cut it short. Repeating facts with their source in an order dictated by dates is not. He should be fired and exiled.